Odds on favourite Estijaab kept her Golden Slipper Stakes chances alive with a a record breaking win in the Group 2 $300,000 Daily Telegraph Reisling Stakes (1200m) at Randwick today. Estijaab, above, wins the Reisling Stakes at Randwick. Photo by Steve Hart. Estijaab was quick out of the barriers and Brenton Avdulla let the Team Hawkes trained filly go straight to the front where she dictated the tempo with ease. The Snitzel filly ran some slick sectionals mid race and found plenty in the straight when attacked from the inside and the outside. Estijaab was always in the red in the betting and went to the post as the $1.40 favourite and while the punters had cause for concern when the challengers came, the filly fought hard to record a neck win. Runner up Pure Elation ($18) was pushing up on the fence to the winner’s inside while first starter Sister Sledge ($81) ran an eye catching third. Co-trainer Michael Hawkes said that Estijaab will now take her place in the Group 1 $3.5m Longines Golden Slipper Stakes (1200m) at Rosehill in a fortnight. “She jumped out of the barriers, Brenton took control and you only have to just win and she has done that and saying that she has run really good time. It was a very good win,” Hawkes said. 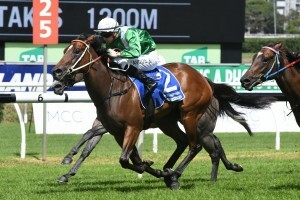 Estijaab is now the $7 second favourite for the Golden Slipper Stakes behind Sunlight who is now the $4.40 top pick.